The Juilliard School, located in the Lincoln Center for the Performing Arts on the Upper West Side of Manhattan, New York City, is a performing arts conservatory established in 1905. It is informally referred to as Juilliard . 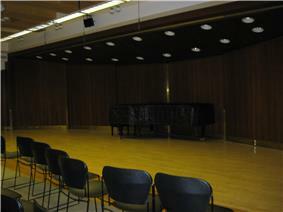 The school trains about 850 undergraduate and graduate students in dance, drama, and music. It is widely regarded as one of the world's leading music schools, with some of the most prestigious arts programs. In 1905, the Institute of Musical Art was founded on the premise that the United States did not have a premier music school and too many students were going to Europe to study music. At its formation, the Institute was located in Manhattan at Fifth Avenue and 12th Street. During its first year, the institute enrolled 500 students. It moved in 1910 to Claremont Avenue in the Morningside Heights neighborhood of Manhattan, onto a property purchased from Bloomingdale Insane Asylum. In 1920, the Juilliard Foundation was created, named after textile merchant Augustus D. Juilliard, who bequeathed a substantial amount of money for the advancement of music in the United States. In 1924, the foundation purchased the Vanderbilt family guesthouse at 49 East 52nd Street to start the Juilliard Graduate School. In 1926, it merged partially with the Institute of Musical Art with a common president, the Columbia University professor John Erskine. The schools had separate deans and identities. The conductor and music-educator Frank Damrosch continued as the Institute's dean, and the Australian pianist and composer Ernest Hutcheson was appointed dean of the Graduate School. In 1937, Hutcheson succeeded Erskine as president of the two institutions, a job he held until 1945. In 1946, the combined schools were named the Juilliard School of Music. The president of the school at that time was William Schuman, the first winner of the Pulitzer Prize for Music. In 1951, the school added a dance division, directed by Martha Hill. William Schuman graduated from Columbia's Teachers College (BS 1935, MA 1937) and attended the Juilliard Summer School in 1932, 1933 and 1936. While attending Juilliard Summer School, he developed a personal dislike for traditional music theory and ear training curricula, finding little value in counterpoint and dictation. Soon after being selected as president of the Juilliard School of Music during 1945, William Schuman created a new curriculum called the Literature and Materials of Music (L&M) designed for composers to teach. L&M was Schuman's reaction against more formal theory and ear training, and as a result did not have a formal structure. The general mandate was "to give the student an awareness of the dynamic nature of the materials of music." The quality and degree of each student's education in harmony, music history or ear training was dependent on how each composer-teacher decided to interpret this mandate. Many questioned the quality of L&M as a method to teach the fundamentals of music theory, ear training and history. William Schuman resigned his job as president of Juilliard after being elected president of Lincoln Center in 1962. Peter Mennin, another composer with directorial experience at the Peabody Conservatory, was elected as his successor. Mennin made significant changes to the L&M program—ending ear training and music history and hiring the well known pedagogue Renée Longy to teach solfège. In 1968, Mennin hired John Houseman to manage a new Drama Division, and in 1969 oversaw Juilliard's relocation from Claremont Avenue to Lincoln Center and shortened its name to The Juilliard School. Dr. Joseph Polisi became president of Juilliard in 1984 after Peter Mennin died. Polisi's many accomplishments include philanthropic successes, broadening of the curriculum and establishment of dormitories for Juilliard's students. In 2001, the school established a jazz performance training program. In September 2005, Colin Davis conducted an orchestra that combined students from the Juilliard and London's Royal Academy of Music at the BBC Proms, and during 2008 the Juilliard Orchestra embarked on a successful tour of China, performing concerts as part of the Cultural Olympiad in Beijing, Suzhou and Shanghai under the expert leadership of Maestro Xian Zhang. In 2006, Juilliard received a trove of precious music manuscripts from the billionaire collector and financier Bruce Kovner. The collection includes autograph scores, sketches, composer-emended proofs and first editions of major works by Mozart, Bach, Beethoven, Brahms, Schumann, Chopin, Schubert, Liszt, Ravel, Stravinsky, Copland and other masters of the classical music canon. Many of the manuscripts had been unavailable for generations. Among the items are the printer's manuscript of Beethoven's Ninth Symphony, complete with Beethoven's handwritten amendments, that was used for the first performance in Vienna in 1824; Mozart's autograph of the wind parts of the final scene of The Marriage of Figaro; Beethoven's arrangement of his monumental Große Fuge for piano four hands; Schumann's working draft of his Symphony No. 2; and manuscripts of Brahms's Symphony No. 2 and Piano Concerto No. 2. The entire collection has since been digitized and can be viewed online. In 2010 philanthropist James S. Marcus donated 10 million dollars to the school to establish the Ellen and James S. Marcus Institute for Vocal Arts at the school. Admittance into The Juilliard School is highly competitive. In 2007, the school received 2,138 applications for admission, of which 162 were admitted for a 7.58% acceptance rate. For the fall semester of 2009, the school had an 8.0% acceptance rate. In 2011, the school accepted 5.5% of applicants. For Fall 2012, 2,657 undergraduate applicants were received by the college division and 7.2% were accepted. Juilliard admits both degree program seekers and pre-college division. All applicants who wish to enroll in the Music Advancement Program, for the Pre-College Division, must perform an audition in person before members of the faculty and administration and must be between ages 8 and 14. Before being scheduled for an audition, each applicant must submit a complete application for admission. After auditions, the school invites select applicants to meet with a program administrator. The 75th percentile accepted into Juilliard in 2012 had a GPA of 3.96 and an SAT score of 1970. All Bachelor and Master courses require credits from the Liberal Arts course; Joseph Polisi is a member of the Liberal Arts faculty. The Pre-College Division began as the "Preparatory Department", part of the Institute for Musical Art. It is now named the Pre-College Division, with Olegna Fuschi as its first director. The Fuschi/Mennin partnership allowed the Pre-College Division to thrive, affording its graduates training at the highest artistic level (with many of the same teachers as the college division), as well as their own commencement ceremony and diplomas. In conformity with Fuschi, directors of Juilliard's Pre-College Division included Linda Granito and composer Dr. Andrew Thomas. The current Artistic Director of Juilliard's Pre-College Division is pianist Yoheved Kaplinsky, who is also the chairperson of the piano department of the Juilliard School. ^ "Still ‘best reputation’ for Juilliard at 100". ^ Frank Rich (2003). Juilliard. Harry N. Abrams. p. 10. ^ "The Top 25 Drama Schools in the World". ^ "About Juilliard: A Brief History". The Juilliard School. January 4, 2009. Retrieved March 25, 2010. ^ "Historical Significance". morningsideheights.org. Archived from the original on February 22, 2014. Retrieved 2014-10-21. ^ Jeni Dahmus (March 2010). "Time Capsule". The Juilliard Journal Online. Retrieved March 25, 2010. ^ A Brief History, The Juilliard School. Retrieved June 13, 2010. ^ Juilliard School, The, The Columbia Electronic Encyclopedia, 6th ed. 2007, Columbia University Press, found in Infoplease. Retrieved June 13, 2010. ^ Fred Plotkin (July 7, 2015). "Remembering James S. Marcus". ^ "The Juilliard School, New York". Citytowninfo.com. Retrieved May 9, 2010. ^ Finnegan, Leah (March 30, 2011). "College Admissions Rates Drop For The Class Of 2015". ^ "About Juilliard". 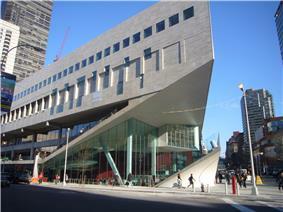 The Juilliard School. Retrieved November 25, 2012. ^ "Juilliard school". Parchment.com. Retrieved November 25, 2012.